Flat out one of the cheapest broadband deals in the UK right now. The prospect of seeing £18 on your monthly bills should make you very happy indeed - just don't let it distract you from the Game of Thrones drama. Trumped on pure price by the likes of Vodafone and TalkTalk, the promise of all that extra TV binging may make you look Now's way instead. And unlike the competition, you only have to commit to a year, rather than 18 months. Some providers crank up the upfront fees to set up this kind of rapid speed (equivalent to over 8MB per second), but not Now. The extra fiver a month could well be worth paying if you're concerned about lots of people using the bandwidth may slay you with interrupted GoT streaming. Sky Q with over 300 channels and 60 Catch Up TV channels. 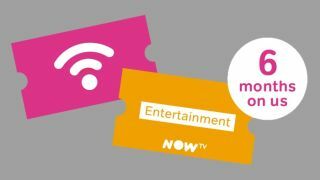 Includes 6m NOW TV Entertainment Pass.